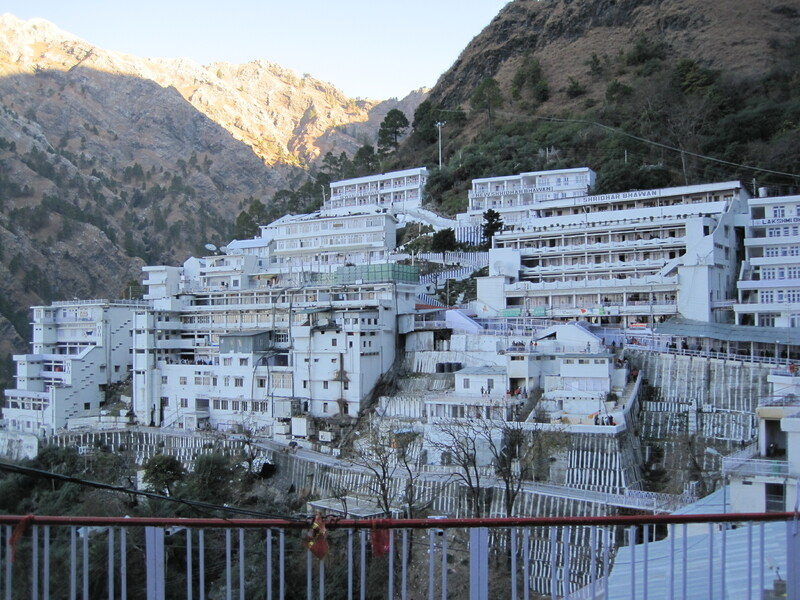 The shrine of Vaishno Devi, which lies on the three peaked Trikuta Mountains in Jammu and Kashmir, India, is one of the holiest of Hindu temples which attracts thousands of pilgrims who hike all the way up to see this holy cave. Vaishno Devi also known as Vaishnavi or Mata Rani is another form of the Goddess Durga, which is worshiped widely in North India. 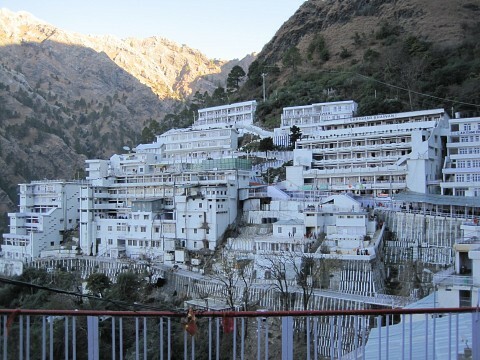 The number of pilgrims traveling annually to Vaishno Devi has far exceeded 10 million. 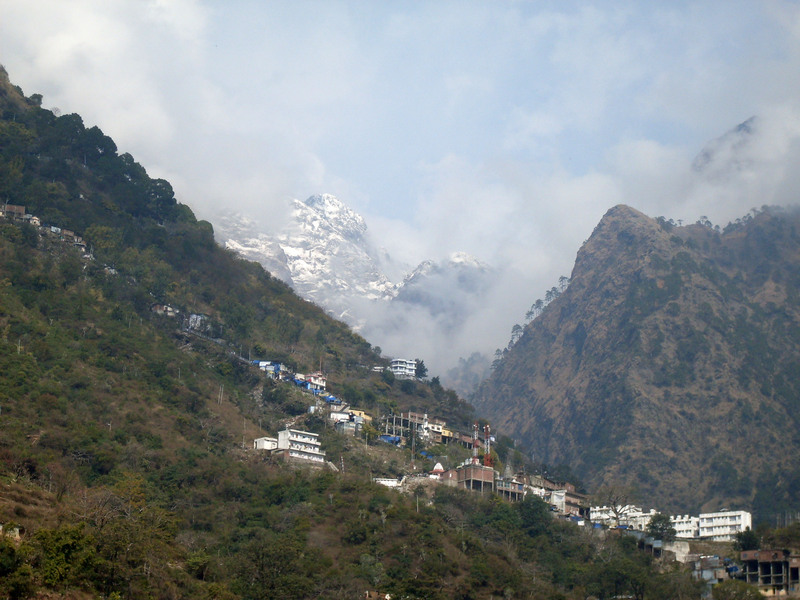 Located at an altitude of 5,200 feet, a devotee has to hike up 8 miles from Katra which acts as a base camp. 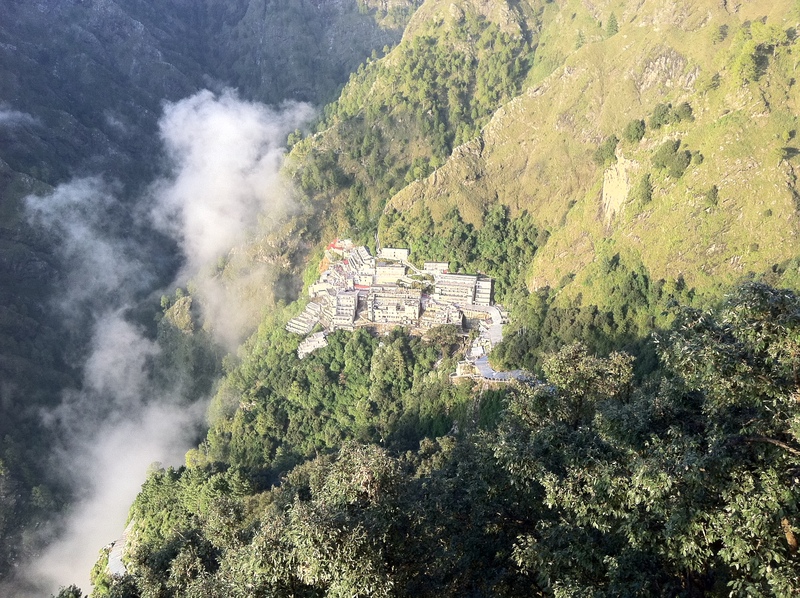 One interesting feature of the Vaishno Devi temple is the conspicuous absence of any idol or statues inside the cave. The Pindies, which are three natural rock formations, are considered to be holy in this auspicious place. It has been said that all true devotees are summoned by the Goddess in their dreams who subsequently make the journey to this famed temple. One of the most important of the 108 Shakti Peetha of India, the legend of Vaishno Devi can be traced from the Chandi Uppurana. After the death of Sati or Durga, her body was chopped off into 108 pieces by Lord Vishnu, out of which 52 body parts dropped on the surface of the Earth and the rest were scattered in other planets. The right hand or the blessing hand of Shakti fell on the planet Venus or Shukra which was ruled by Goddess Lakshmi. However, there was a demon known as Mur who got a boon from Brahma as a result of which he was infallible. During the God-Demon war, Lakshmi, the ruler of the planet, asked for Parvati’s help in defeating the demons or the Asuras. As a result, the three divine forms of Shakti – Maha Kali, Maha Saraswati, and Maha Lakshmi combined their collective spiritual strength to create a beautiful young girl called Kumari. After this, the three Goddesses dropped the three Pindies, or sacred stones, which were brought to planet Earth by Lord Shiva, so that the demons won't know about the birth of Kumari, the miracle goddess. During the war, when the demon came to destroy Lord Vishnu, it was Kumari who killed the demon. Kumari's birth took place in the house of a man called Ratnakar in South India and was named Vaishnavi by the couple. She showed an immense hunger for knowledge which no teachings were able to satiate. It was then that Vaishnavi started self-reflection, meditations, and penance to discover her true self. In a few years, she left the comforts of her home and went to live and meditate in the woods. In the mean time, Lord Rama, who was sent to 14 years exile by his father, happened to be in the same forest as Vaishnavi. Rama immediately realized that Vaishnavi was no ordinary human but a Goddess and the incarnation of Vishnu. Knowing about her true self, Vaishnavi begged him to merge himself with her so that she could become unified with the supreme creator. However, Rama replied that the since it was not the right time, he would come to the forest to visit her again. Rama kept his words and after emerging victorious in the battle against Ravana, he came to the woods looking for Vaishnavi in the guise of an aged man. However, Vaishnavi couldn't recognize Rama and so Rama again consoled her by saying that the time for unification would only come in the Kaliyug. Rama taught her the correct methods of self meditation and set up an ashrama for her at the bottom of the Trikuta Hills, so that she could practice meditation and elevate herself spiritually. Immediately Vaishnavi started a long journey to the Himalayas and after a long and arduous journey, reached the Ashram at the foot hills of Trikuta Hills. In no time, her glory and fame traveled far and wide and people from all over started to flock to her Ashrama to seek her blessings. After some years, Mahayogi Guru Gorakshanath, a Hindu yogi who dreamt of the episode between Vaishnavi and Rama, wanted to know if the Goddess had really attained a higher spiritual level. Therefore he sent his most devout follower, Bhairo Nath, to the Trikuta Mountains to find out the truth. On reaching the Ashram, Bhairo Nath secretly observed Vaishnavi to discern if she really had attained a higher level of spiritual learning. He realized that although she was a devout worshiper, she was always armed with bows and arrows and surrounded by wild animals like a lion and langurs or apes. Enamored by the divine beauty of Vaishnavi, Bhairo Nath started pestering her and asked for her hand in marriage. It was then that Mata Shridhar, a disciple of Vaishno Devi, arranged for a community feast or Bhandara where everybody, including Gorakshanath and Bhairo Nath, were invited to enjoy a meal. During this feast, Bhairo Nath went out of his bounds and grabbed the arms of Vaishnavi. Since Vaishnavi, in spite of her best efforts, was unable to daunt the attempts of Bhairo Nath, she decided to run away deep into the mountains to carry out her meditations peacefully. 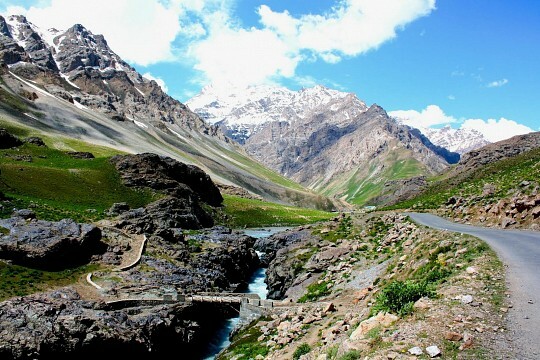 But the persistent Bhairo Nath followed her into the mountains. On reaching the holy caves on top of the Trikuta Mountains, she could not help killing her unwanted admirer and in a fit of anger, she beheaded him. Only after his death did he realize his folly and prayed hard for the forgiveness of Vaishnavi. The Goddess finally had mercy on him and gave him a boon so that every disciple of the Mata, who is making the journey to the holy cave would have to see the site where the head of Bhairo fell, and only then would the devotee get the full blessings of the Mata. Then the Devi rid of herself of her human appearance and took the shape of a five-and-a-half-feet tall rock with the three Pindies, or sacred stones, on its top. Unlike other Hindu shrines, it is not possible to ascertain the exact time when pilgrims started visiting this cave. 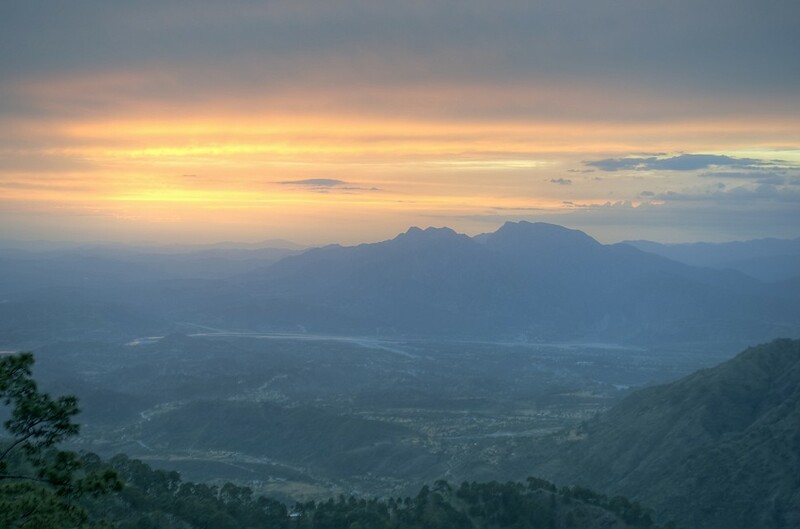 The Goddess Shakti or the Trikuta Mountains don’t find mention in the Rigveda. It is generally assumed that the worshiping of the Shakti cult started during the Puranic period. The earliest reference of the Mother Goddess can be found in the Mahabharata where the Pandava brothers looked for her blessings before the war at Kurukhestra. Guru Govind Singh, the Sikh guru, is said to have visited this shrine. According to Hindu mythology, the skull of the Goddess fell at the Trikuta, though some sources say that it was the right arm which dropped at this site. For the convenience of the devotees, there are free eating houses and free accommodation facilities both on the way and on reaching the ultimate destination called The Bhawan. Free lodging and eating places can also be found on the way to the cave at places like Ashkuwari, Sanjicchat and of course, Bhawan. One can also find toilets, eating houses and medicinal facilities on the way to the caves. 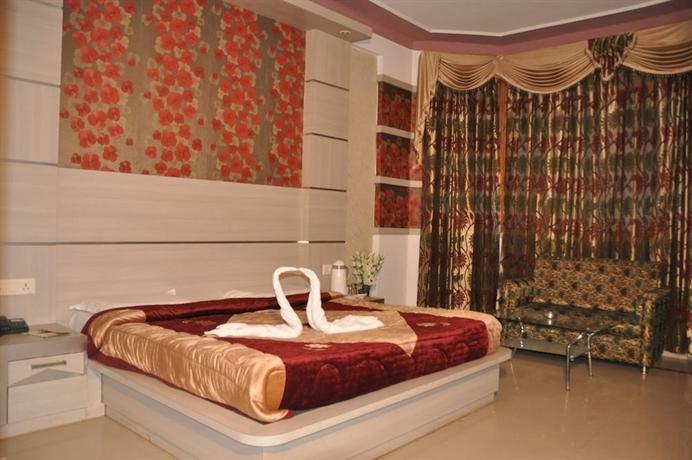 Visitors can also take a clean and basic room for as less as ₨ 100 ($1.60) per bed on this pilgrimage. The base camp for Vaishno Devi is the small town of Katra which lies about 28 miles from Jammu, the winter capital of the state of Jammu and Kashmir. From there devotees can proceed towards Bhawan after obtaining a journey slip, or Yatra parchi, from Banganga. A 8 miles long uphill walk from Katra will take the visitor to Bhawan. One can also travel on horseback or hire a palanquin. 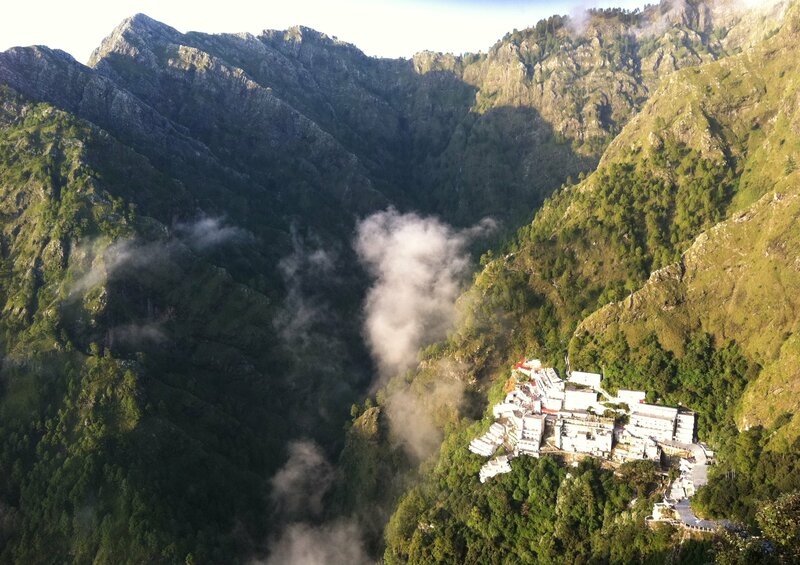 The visitor to the holy cave of Vaishno Devi must cross the town of Jammu. 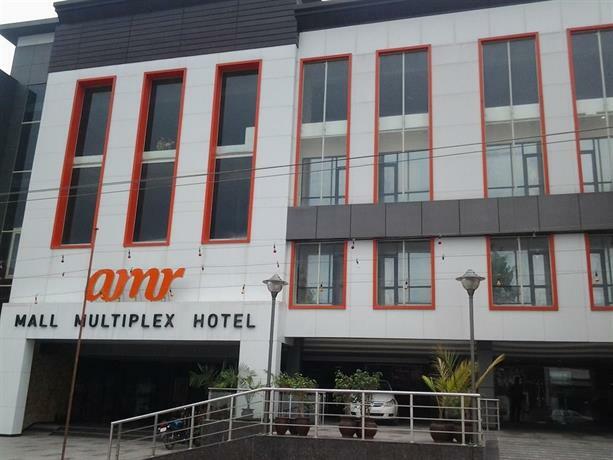 Jammu has an airport which operates regular flights to other important Indian cities. From Jammu, the town of Katra is just 28 miles away and can be reached by train or cars. Katra also has a train station and one can directly go from Delhi to Katra by train. From Katra, one has to hike up 8 miles to reach Bhawan, which houses the holy shrine. 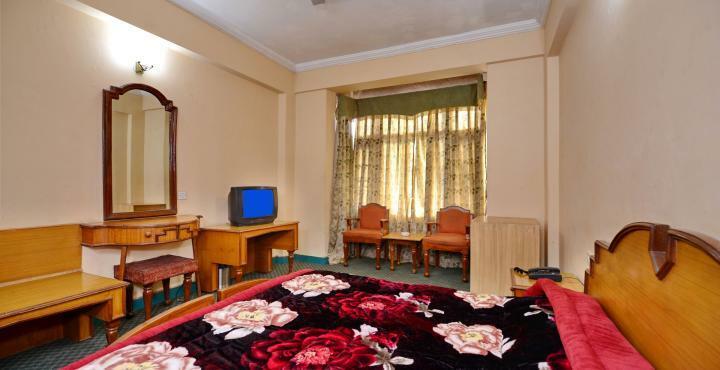 Visitors to Jammu and Kashmir must visit the beautiful valleys of Sonamarg and Gulmarg in Kashmir Valley. Pilgrims and devotees would surely like to visit the ancient Amarnath Temple, dedicated to Lord Shiva.